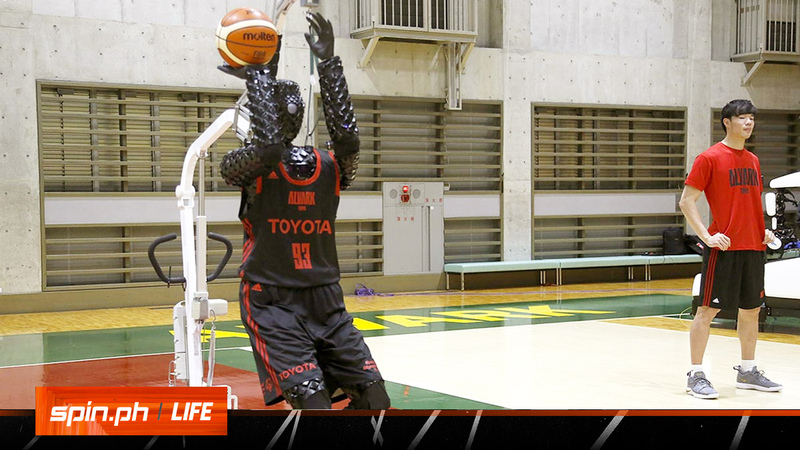 TOKYO — It can't dribble, let alone slam dunk, but Toyota's basketball robot hardly ever misses a free throw or a three-pointer. The 207-centimeter (six-foot, 10-inch)-tall machine made five of eight 3-point shots in a demonstration in a Tokyo suburb on Monday, a ratio its engineers say is worse than usual. Toyota Motor Corp.'s robot, called Cue 3, computes as a three-dimensional image where the basket is, using sensors on its torso, and adjusts motors inside its arm and knees to give the shot the right angle and propulsion for a swish. Efforts in developing human-shaped robots underline a global shift in robotics use from pre-programmed mechanical arms in limited situations like factories to functioning in the real world with people. The 2017 version of the robot was designed to make free throws. Yudai Baba, a basketball player likely representing host Japan at the 2020 Tokyo Olympics, took part in the demonstration and also missed a couple of shots. If the robot could learn a few more tricks, he was ready to accept the robot on the team, he said. "We human players are still better for now," he said. Right after missing, the robot slumped over. It wasn't disappointment, but a temporary power failure. Cue 3's name is supposed to reflect the idea the technology can serve as a cue, or signal of great things to come, according to Toyota. The company plays down how the technology might prove useful. It's more about boosting morale among engineers, making them open to ideas and challenges. In making the robot's outer covering something like that of an armadillo, the engineers said they were just trying to avoid the white metallic look often seen on robots. The maker of the Camry sedan, Prius hybrid and Lexus luxury models has shown off various robots, including one that played a violin. Another, resembling R2-D2 of Star Wars, slides around and picks up things. At Monday's demonstration, it handed the basketball to Cue 3. Experts say robots that can mimic human movements, even doing them better, could prove useful in various ways, including picking crops, making deliveries, and working in factories and warehouses. Stanford University professor Oussama Khatib, who directs the university's robotics lab, said Cue 3 demonstrates complex activities such as using sensors and nimble computation in real-time in what he called "visual feedback." To shoot hoops, the robot must have a good vision system, be able to compute the ball's path then execute the shot, he said in a telephone interview. "What Toyota is doing here is really bringing the top capabilities in perception with the top capabilities in control to have robots perform something that is really challenging," Khatib said. Japan has been aggressive in developing humanoids, including those that do little more than offer cute companionship. Toyota's rival Honda Motor Co. has its Asimo, a culmination of research into creating a walking robot that started in the 1980s. It not only can run, but also recognize faces, avoid obstacles, shake hands, pour a drink and carry a tray. When will such robots be able to slam dunk, a feat that will require running, dribbling and jumping? "In 20 years, with technological advances," said Tomohiro Nomi, a Toyota engineer who worked on Cue 3.